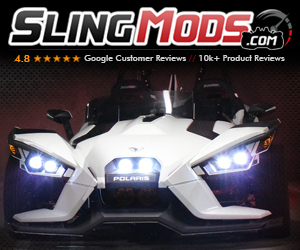 The #1 forum for everything you need to know about the Polaris Slingshot. Liked SoCal’s post in the thread helmets - do you use one? and if yes what do you use?. To each his own and I respect everybody for the decisions they make as it is just that - their decision. Helmetless for the past year in California with no issues. And this is the biggest nanny state in the union. Liked chavey2’s post in the thread Club Slingshot. Yeah, but we still like you anyways. Replied to the thread Removing Tail Fin Light. Liked chavey2’s post in the thread Removing Tail Fin Light. Here's the link to the rear deck removal that will allow you to get to that light: Rear Deck Video. It is pretty involved but easy to do. Lots of fasteners. Liked Rob the Slob’s post in the thread Removing Tail Fin Light. Here is a short video of brake light modulator installation that may help you. Liked gooseman’s post in the thread Out of the saddle for awhile. Liked wokka’s post in the thread What was today's Sling project-Mods , goodies.....?. It stops the flex of the master cylinder and makes them feel a bit more stiff. It's a pricey bit of aluminum for sure, but totally worth it to help the brakes. I'm also replacing the ceramic pads with the blackhawk 5.0 and some new rotors. Replied to the thread Out of the saddle for awhile. Liked maverick5990’s post in the thread Cleaning /shining black plastic. Liked the image Our New Toy.